Educators and librarians have long known that culturally specific resources geared to multi-cultural learning for very young children are difficult, if not impossible, to find. Yet, these materials are vitally important in helping young children increase their understanding of their own culture, as well as the cultures of others in their community and beyond. 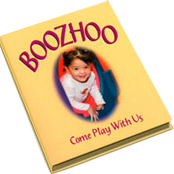 “Boozhoo”, “Our Journey”, "Niiwimin Powwow" and "The Story of Manoomin" are four books aimed at filling this void. It is with great pride that we offer these four books for use at home, in schools, libraries and other educational settings. Join the families of Fond du Lac Head Start as they take part in the harvest of Manoomin (wild rice). This book takes you on a journey beginning with the growth of the manoomin and ending with children enjoying the wild rice as a meal. This book tells the story in English with Ojibwe words provided by Language consultants Tara Dupuis & Sonny Greensky. Come play with the children of the Fond du Lac Band and learn words from the Ojibwe language. This book features beautiful photographs of Fond du Lac children, simple words and phrases along with a pronunciation guide. It was created by Deanna Himango, Ojibwe language consultant, Andrea Junker, pre-press consultant and Rocky Wilkinson, photographer and pre-press designer. 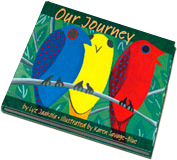 This beautifully illustrated book portrays traditional Ojibwe culture, taking the reader on a Native American journey. “Our Journey” shows respect and reverence for nature by saying hello (anin) and thanks (miigwech) to the six directions. Text is poetic, repetitive, simple and reassuring for very young children. For older children, the rich artwork provides a guide to introducing the stories of the Ojibwe. Join the children of Fond du Lac Head Start as they celebrate the Ojibwe culture through the ancient tradition of the Powwow. This book gives the reader a look at the Powwow from preparation through to the Grand Entry, the dancing, the feast and an invitation to Native and non-Native alike to "see you at the next year's Powwow". Early Head Start or Head Start programs.